Why are the popular parts of government growing the slowest? I’m at Duke University right now, taking a summer course on the history of economics in the 20th century, so posting may be light. Drop me a line if you have recommendations for things to do near Duke or want to say hello! Overall, then, government’s role has not increased. The whole Obama/socialist thing never happened. And here’s the thing: government’s role should have increased, at least for now. We still have a private sector in the throes of deleveraging, which means that this is a time for the government — which can borrow at negative real interest rates! — to be spending more. Instead, the entire brief increase in government’s role during 2009-2010 has now been unwound, with more cuts to come. The reason that overall government spending is basically flat has to do with the counteracting forces of increased federal government spending (via the stimulus and automatic stabilizers, i.e. social welfare programs) and decreased state and local government spending (forced by balanced budget amendments, among other things). For example, local governments are actually cutting employees. 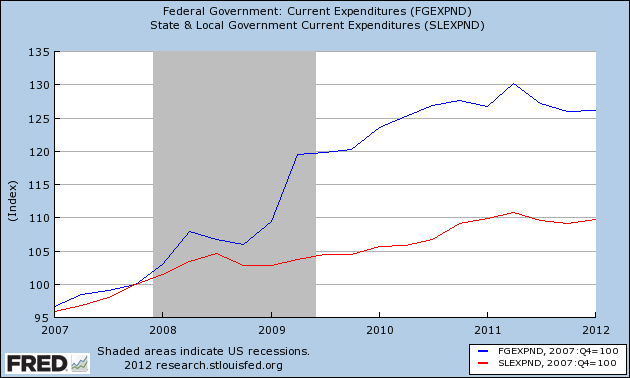 Here’s a graph of federal vs. state and local current expenditures (not adjusted for inflation, but indexed to 2007 = 100). 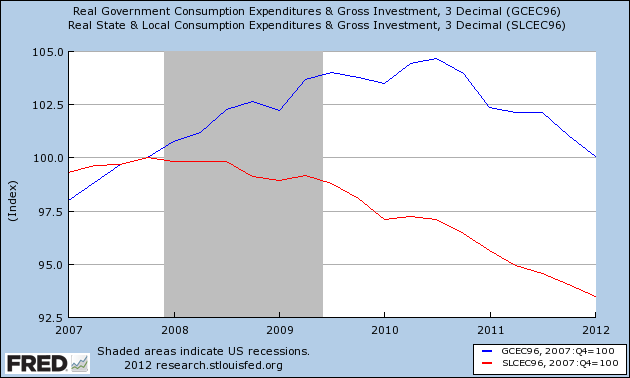 Here’s a similar graph of real (adjusted for inflation) state and local expenditures and investment vs. all government. State and Local government are decreasing as a proportion of government spending – and by this measure, actually decreasing in real terms. So, the consistently most popular parts of government are flat or shrinking, while the less popular parts are growing. Oops? pretty sure it has to do with states requiring balanced budgets. Yeah, I think the institutional forces creating the phenomena are pretty clear (as mentioned in the post). The “why” of the post title should be interpreted in a more normative sense – stepping back, does this make sense? How does this accord with our deeper theories of politics and public opinion? Etc. Maybe it’s mostly a case of people generally taking a dimmer view of central politicians than local politicians? I remember reading something about that, ages ago.